Site Fácil Review 2019: Is Site Fácil a Good Hosting? Site Fácil has been providing hosting with a range of beginner friendly features since 2005. The plans don’t come with an uptime guarantee, but they use SSD and have a great price point. Site Fácil has been in business since 2005, providing website hosting and domain registration. It has more than 10,000 customers who are located primarily in Portugal and Brazil, however, also in England, the Netherlands, Angola, Mozambique, Egypt, Gibraltar, and others. The website is available in Portuguese. There are three tiers of shared hosting plans: Smart, Advanced, and Premium. Aside from increasing disk space (from 5GB to 100GB) and only one domain in the base plan, the features and resources are the same in all plans. Overall, the resource quotas are substantial. All of the plans use SSD storage, which is good to see because it means your fast performance should be up to 300% faster than traditional HDD, as well as cPanel, which is a beginner-friendly and easy to use control panel. There’s an installation of Site Builder PRO with all of the packages, which comes with a drag-and-drop builder and is designed for people with no coding experience, along with a Softaculous one-click installer for a premium 300 programs. In terms of which advanced level features are supported, I can tell you plans come with PHP (version unknown), phpMyAdmin tool, and MySQL databases, but that’s all that is advertised on the website. I tried to confirm with support if there are Cron jobs or SSH access, but I was only advised that SSH is not allowed, so I can’t comment on Cron jobs. The plans are good value for money. The middle package “Advanced”, includes all of the same features with unlimited domains, transfer, and 25GB disk space, which is more than enough resources for a reasonable monthly price. You will need to purchase a domain and SSL certificate and the plans are only available in one, two, or three year terms with no discount for purchasing upfront, plus there isn’t a money-back guarantee. However, the plans are so well priced, I can understand why the payment terms are quite restrictive. Site Fácil offers support by email and tickets 24/7, so if you like phone support, this is not the company for you. There are a few inactive social media profiles, a customer area, and a helpful knowledge base, so not a bad level of support overall. I contacted the team by email early morning on a Wednesday and received replies to both of my emails within a few hours. The replies were polite, if a little incomplete, without answering the questions in full. That said, I am sure a quick follow up email would resolve that easily. Site Fácil comes across as a no-nonsense company with some social principles – it offers support to nonprofits alongside its regular provision. The hosting plans use SSD and have high resource allocations all for a good price, you just might be sacrificing an expert level feature or two. 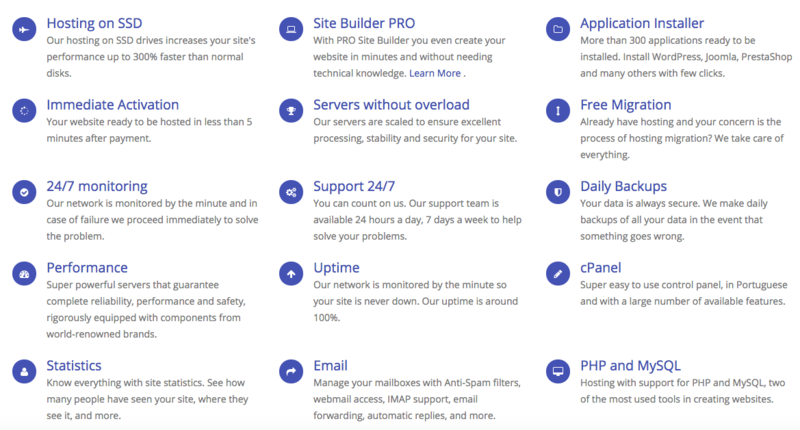 Wondering how Site Fácil stacks up against other Web Hosting companies? Enter any other Web Hosting company and we will give you a side-by-side comparison.